The 36th and last Annual Convention of District105BN took place between the 1st and 3rd of March at Stretton, near Warrington. The District will now merge with District's BS, C, and E, to form the new DIstrict 105CN which comes into effect on the 1st July 2019. Bolton Lions Club were well represented with members DG John Crompton, Club President Michael Crompton, Stuart Bedson, Mandy Broadbent, John Fairhurst, Jeff Hartley, Tony Foster, Brian and Linda Pearson, Richard Tonge and David Seager in attendance. Below is Club Secretary, PDG Stuart Bedson's excellent report on the Convention. For 12 months from the 1st July 2018 Bolton Lions have had the honour of a member of their Club elected as District Governor of District 105BN. That member is Lion John Crompton. One of the highlights of a District Governor’s year in office is to chair the business sessions of the District Annual Convention which this year was unique as it would be the last prior to merging with Clubs from ‘BS’, ‘C’ and ‘E’ as from 1st July 2019. The event held over two days, has been a great success and a fitting tribute to the 36 years of service by Clubs in the District serving their communities in the Northwest of England and the Isle of Man. Friday night is usually an informal night, this year taking the theme of “Motown” and this, together with the Convention theme for the week-end of “1983 – Back to the Future – 2019” stirred the imagination of many attendees, resulting in the display of some outrageous fancy dress costumes!! Saturday is devoted to the ‘AGM’ of District 105BN with reports from Cabinet Officers, Presentations to the various District Competition Winners, Introduction and Presentations to the Youth Activity winners and a look into the future by the District Governor Elect of the new District 105CN. With very little formal business to transact this year, time was well put to receive Presentations from charity groups supported by the District and individual Clubs. The "AGM" was concluded ith the customary address by the International Guest representing the International Association of Lions Clubs - International Director Sandro Castellana from Italy. 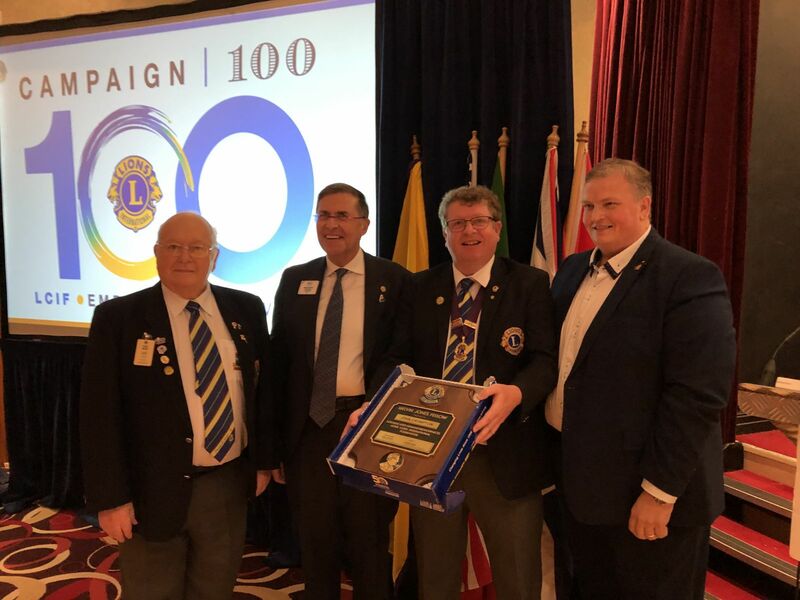 Following his address to Convention, Director Castellana on behalf of the members of Bolton Lions Club, presented District Governor John Crompton a Melvin Jones Fellowship (MJF) – highest honour that can be bestowed on an individual. DG John was visibly moved by the occasion. The business session of Convention closed with the singing of “Land of Hope and Glory” and this year (supplied by the PA/IT department) a generous spray of confetti!!! On Sunday 17th June, Bolton sailing Club held its annual Regatta Day where a special boat for the disabled bought by Bolton Lions was launched.The boat is in memory of long-serving member of over forty years, the well-respected and loved Bill Laithwaite, a wonderful, hardworking servant of the club who held many offices during his Lions tenure including that of being President on two occasions. The Bolton community has benefitted greatly through Bill's many years of dedication to charitable causes through the offices of Bolton Lions, and he is sadly missed. In addition there is a Bill Laithwaite trophy for the winner of the disabled class race which is to be competed for annually on Regatta day. In August the club were grateful to be the recipients of a generous donation from Acumension a Manchester based company of Solicitors. Funds faised by the concert given by the Smithills School bands and Eagley Brass Band on the 8th April 2017 will be used to provide Prostate Cancer Screening aimed at 50 year olds and upwards. 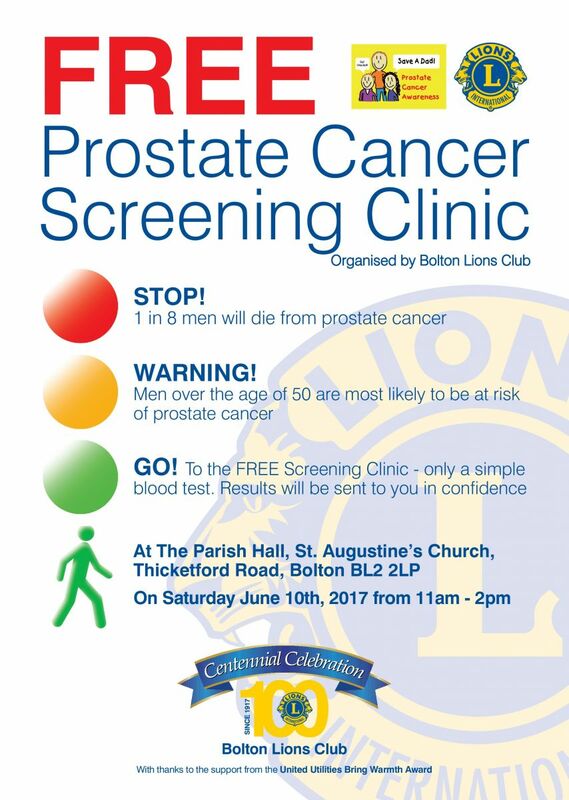 Although this will be a free service, donations can be made which will mean even more men can be screened. The poster below gives details of the event. Lions John Fairhurst and Ray Stafford met up with Sky Sports presenter Jeff Stelling at the Macron Stadium on Thursday the 8th June to promote the event by being photographed with him. He is raising money for Prostate Cancer Uk by walking 15 marathons in 15 days whilst visiting 40 of the country's top football grounds. Jeff even manages to raise a smile stuck between us two! As a result of a £1million refurbishment of the Newport Street area of Bolton, the Charities canopy used for fundraising is to be taken down and has been replaced by a Pod, about an eighth of the size of the Canopy, located near Bolton Market. As at this moment the club have not used the new facility, but below is the link to an article published in the Bolton News on the 17th October which gives the reaction of charities that have used it. In the past few years we have been raising approximately £1500 per annum at the Canopy. The following link takes you to a letter from a charity regarding their experience of the new Canopy.